One of the first bits of advice beginning writers are given is “show don’t tell.” Short and sweet, the phrase verges on cliché. 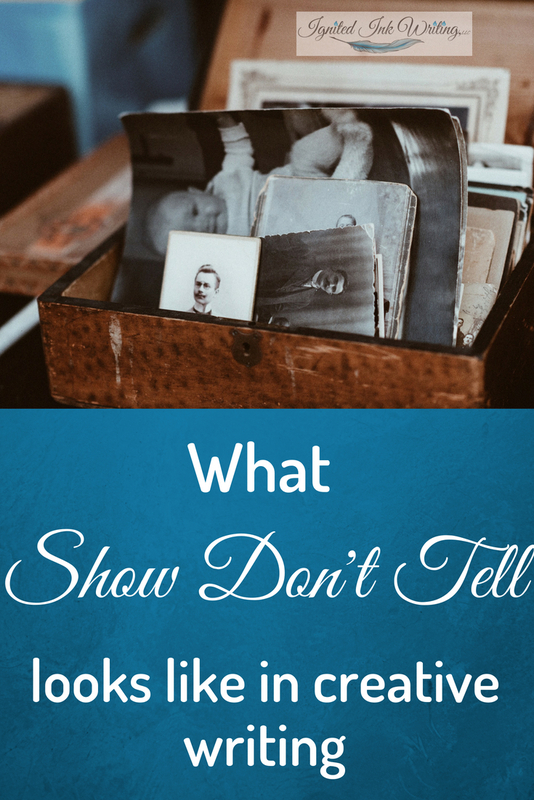 It’s one thing to tell a writer to show instead of tell. It’s another to demonstrate what that means. What does showing look like on the page? What does telling look like? Showing emotions, setting, and backstory can be the difference between a bland, slow story and one that compels a reader to turn the page. David and Anna had been married for twenty-five years and were just as devoted to each other as when they’d first met. Anna’d miscarried six times. After the last one had to be delivered stillborn via C-section, they decided children weren’t in their cards. The above passage is telling the reader David and Anna’s history because there is no action, movement, or emotion. The section doesn’t reveal how either character feels about their marriage or lack of children, nor does it provide insight into their current relationship. It only lists a few facts from their history. David tugged one of Anna’s graying curls while she did her makeup like he had every morning for the last twenty-five years. She batted his hand away and shot him a soft smile. “Do you think it will be too hot for this sweater?” asked Anna. “It is supposed to be in the eighties,” said David. She nodded, tossed her makeup in the drawer, and pulled the sweater over her head. With a grin, he wrapped his arms around her stomach, caressed the C-section scar from their final attempt at children, and kissed her neck. The above section shows the reader David and Anna have been married for twenty-five years and are still in love through the playful tug, smile, and embrace. While it doesn’t explicitly state they miscarried six times, the passage does show the scar on Anna’s stomach and discloses no children survived. The fact that David can touch Anna’s scar without her freaking out shows how they have overcome the loss of children together and are comfortable with each other. The scene both reveals the past and expresses the present through action. Because the characters are doing something, the story feels like it is moving forward. When backstory is shown instead of told, it reveals more than pages of description. It can both divulge a secret or moment from the past and affect the present. Shown backstory creates the opportunity for intimacy and vulnerability that told backstory doesn’t. The high noon desert sun baked the sand and sparse plants until even the cactus seemed to droop. The monolithic sandstones offered little to no shade, but did provide a break in the horizon. A hot breeze raced by every now and again, stirring up the scent of dirt, creosote, and sage. While the description provides a vivid mental picture for the reader and includes three of the five senses, it is only a place. There is no action, movement, or plot occurring and no characters are present. There is no emotion attached to the scene. Dashing to the nearest sandstone, I felt the rubber soles of my shoes grow soft with heat from the sand. I’d run out of sweat thirty minutes ago, but I had to push through the dizziness and could only afford to press my back against the tiny sliver of shaded stone for a moment. Nina needed me. And I owed her. I filled my lungs with a dirt creosote, and sage scented hot breath and ran on. The above passage contains most of the description from the original setting paragraph: hot day, noon, sandstone, and the smell of the desert. However, instead of reporting the features of the landscape, the new passage shows a character interacting with the setting and transforms it into an obstacle. It’s not just a hot day in an isolated desert. It’s a day when a character needs to get to a friend and must risk heat stroke and dehydration. You can show setting in a variety of ways. You can infuse it with emotion, such as a storm mirroring the tensions and conflict of the story. You can have a character interact with it like in the above paragraph, or you could have the setting propel the story forward by describing how it changes over time. The key to showing setting is not allowing it to become stagnant. Joe was pissed Brian waited until now to mention he was dating Joe’s ex. At the revelation Brian was dating his ex, every muscle in Joe’s body tensed. He resisted the impulse to punch Brian in his stupid face and grinned. “I gave her herpes,” he said. The only information being conveyed in the first line is Joe is upset Brian is dating his ex. The second example never flat out says Joe is angry; instead the lines show his anger through body language, inner desires, and his reaction. By showing your reader your characters’ emotions, you have the opportunity to develop them more because you get to show how they handle the emotion and how it feels in their body. Showing backstory, setting, and emotion allows writers to do more with each of these aspects of their story. It provides opportunities to dive deeper into the characters and plot and convey more information to the reader. However, showing isn’t always the best option. Sometimes you need to quickly reveal a bit of backstory, set the scene, or divulge how a character feels. Sometimes telling will be the best choice for your story. A balance must be struck between showing and telling, but not an equal one. Overall, most readers prefer showing, so writers should strive to show whenever possible. However, if you find yourself jumping through convoluted hoops, inserting unnecessary details, or taking tangents, you might need to tell. You must look at your specific story’s backstory, setting, and emotion and decide if showing or telling will Ignite Your Ink. Do you prefer showing or telling as a reader? Why? Share your thoughts in the comments below. For more blog posts designed to help you improve your writing, subscribe to Ignite Your Ink. 13 Writing Craft Books Every Writer Should Explore! If you want to improve your writing, check out these 13 writing books covering everything from general advice to writing prompts. You'll also be notified of Ignite Your Ink's articles and receive advice from an editor just for subscribers. Click here to download your list now or wait for it to arrive in your inbox. Good luck igniting your ink!